What is guilt? Why do so many women, especially mothers experience this, fairly regularly? Guilt is a sense of feeling bad about yourself. Bad about activities you do (or don’t do). Bad about not being enough. Women can feel guilty that they aren’t beautiful enough, they don’t do enough, they don’t earn enough, that they haven’t done something right. I have a lot of interaction with women and have done in my capacity as an acupuncturist specialising in obstetrics and gynaecology for over 20 years. When going through case histories, I ask “do you work”. Frequently, the answer is no I look after my 2 year old, or no Im a stay-at-home mum. What? – you don’t call this work? When myself and my husband started having children, we both worked part-time hours so we could both share the childcare and the paid work. It was very clear from the outset that the one who “went off to work” was definitely having the easiest day – and they were being paid for it!!! I know quite a few women that have been financially supported by their partners and they have run the house and brought up the kids full time for many years. I am saddened about how easy it is to not have a high self-esteem when doing this. Mothering, housework, childcare – these are really under-rated professions and unpaid! And yet how vital is a well-loved, self-confident, well-fed, cherished child to our society? – they grow up into being self-confident, independent, creative adults – how important is that? How is your sense of self-worth? If you want to test it out, try not working or earning money for a bit? It is way easier to keep yourself busy, and to feel of value to society and to be paid, than having a lot of time on your hands, and no work to do. We need to remember, we are not what we do. We are beings, human beings. Our value comes from just existing. Our best service to the world is not working really hard and earning lots of money, and consuming more than we need. But more than that, being compassionate, loving, kind, peaceful, calm, generous, supportive, caring. We can express these qualities in any area of our life. These are all very feminine qualities, which is interesting that these are undervalued in our patriarchal society. But the tides are turning, more and more people are turning to mindfulness, meditation, getting a work/life balance, valuing inner peace and calm, being content with less material objects. These qualities are the ones that will save our planet, instead of greed and a feeling of lack. Remember, you are enough! You are valuable, important and worthwhile, just because of your very existence! 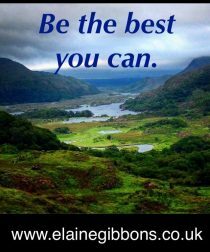 Be the best you can be – for yourself – not to live up to any external standard.